First, I gave two points for a win over a top 25 RPI team and one for a win over a 26-50 RPI team. Then, I subtracted one point for a loss to a 26-50 team, and two for a loss against a sub-50 team. I then added points based on the remaining schedule: .5 for a game remaining against a top 25 RPI team and .25 for a game against a 26-50 RPI team. Teams more than one game under .500 in conference are not allowed in. Many teams were moved within the same seed to prevent teams in the same conference from meeting before the conference finals or to meet the new rules about conferences with top four seeds. Ties went in favor of the team with the most points on current wins and losses. If still tied then better RPI. The cut off for getting in as an at large was 0.25 points. It took 11.75 points to get a #1 seed. Wow, Baylor is a 7-seed. They need a tougher schedule. Who do you have replacing them? Notre Dame will play Tennessee soon and Louisville on Thursday. Yet, they are seeded 10th or 11th. Does that mean every team seeded equal to or below them is a conference winner? If Michigan St is a #10 seed, where is my team? In the real world, Baylor is a top seed. In the clunky algorithm world, I guess they're a #7 seed. Where does Charlie put them? It's generally difficult to get a high seed with no top 25 wins and an SOS outside the top 100, especially coming from a conference outside the top five in CRPI. However, you're correct that the committee is likely to be influenced by hype over substance. WOW! Baylor has 0 Top 25 wins and a SOS outside of 100? That is just irresponsible scheduling, Kim. Their only top 50 win is the one over Stanford. That and the UCLA loss are Baylor's only games against the RPI top 50. If Baylor gets treated like Maryland was last year, they are probably at best a 3-seed or at worst a 4-seed as of right now. 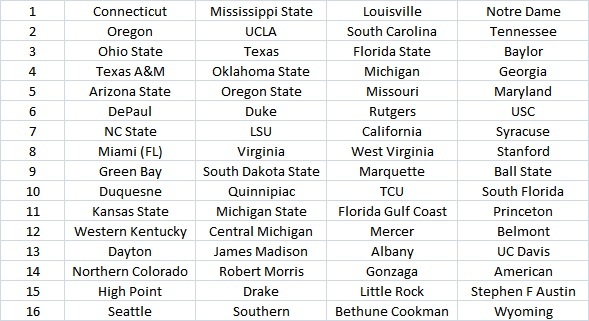 According to my formula (which predicts bubble teams well as is it had Cal and UNI in last year) right now Minnesota is approximately my 16th team out. If Minnesota didn't lose to both San Diego and Nebraska, they'd probably be in my last four in. Maryland had nine top 50 wins last season. Baylor could win out and not have that many. Baylor's non-con SOS is even worse than Maryland's was last year, and the B12 is rated worse than last year's B10. The real issue for Baylor is how they do from here on out. They have two games each with Texas. 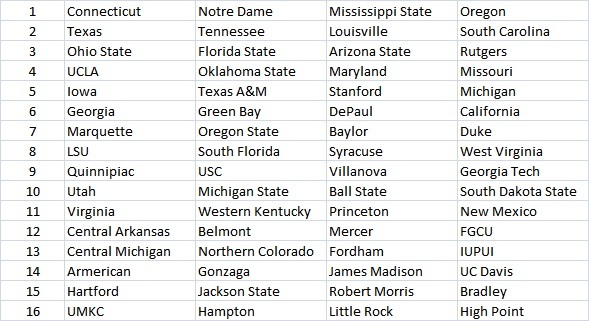 West Virginia, Oklahoma St and Oklahoma, all currently top 50 teams (I believe OK St was 53 when these numbers were calculated, but I show them now at #50). They will also likely play two more in the Big 12 Conference tournament. If they go 8-2 in those games no one will care about their weak schedule and they will get at least a 3 seed, maybe a 2. If they win the Big 12 regular season and conference tournament they will get at least a 2. The weak schedule will only hurt Baylor if they slide to third or fourth in the Big 12. In that case the schedule will become a problem and Baylor could get a lower seed than their poll ranking would suggest. I would also note that the resumes of Baylor and Oklahoma St are nearly identical, and yet OK St is a 4 and Baylor is a 7. Based on the calculation, I believe these are the differences : OK St beat Oklahoma and lost to Texas, Baylor hasn't played either yet (+.25), OK St beat #16 UCLA, Baylor beat #27 Stanford (+1), Baylor and OK St haven't played yet (+1). The last one is because Baylor is #20 and OK St is #53. This is not a criticism of the formula; just an acknowledgement that any numerical calculation at this point in time is bound to have anomalies. Finally a question. Looking at Quinnipiac, they are shown as a 9 seed which would indicate they have a positive score, but when I look at there record they seem to have no wins over top 25 teams, no losses against sub-50 teams and are 2-2 vs. teams that are 26-50. They also have no more games against teams in the top 100. Is this just a calculation problem or am I missing something? For some reason my parser picked up two schedule points for them. They should be at zero, which is a #11 seed. The NCAA elected not to publish the women's nitty gritty report today, so no projection. The men's report is available, of course. They must've given the WBB reports the holiday off. How do you parse the Nitty Gritty pdf? I don't know how to do it, and me doing it manually for my formula takes too much time. I do it with excel. This site: https://pdftables.com/ does a marvelous job of converting pdf tables. Many teams were moved within the same seed to prevent teams in the same conference from meeting before the conference finals or to meet the new rules about conferences with top four seeds. In this instance four teams swapped seeds to avoid this. LSU moved up one and Virginia moved down one. The cut off for getting in as an at large was -1.25 points. It took 13.75 points to get a #1 seed. Welcome to the real world.... as far as Baylor goes. ND a one seed.... how long will that notion last? They don't have the feel of a credible #1 seed. Who would you put there ahead of them? I think SC should be higher. It seems they get pushed down more than other teams. BTW I was talking about recent rankings not above. I'm not sure of that either. Seems like there's a separation between the Top 3 seeds and the next 9 seeds. Baylor's only loss is on the road in a game when they didn't have their second best player and their coach. That's something you can't program into a simple algorithm. If Baylor was undefeated, would anybody be doubting them as a #1 seed?